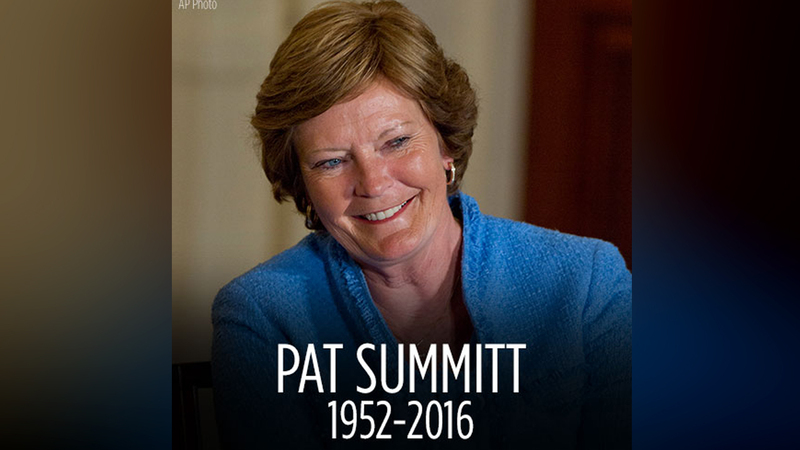 KNOXVILLE, TN -- Pat Summitt, the winningest coach in Division I college basketball history who uplifted the women's game from obscurity to national prominence during her 38-year career at Tennessee, died Tuesday morning. She was 64. With an icy glare on the sidelines, Summitt led the Lady Vols to eight national championships and prominence on a campus steeped in the traditions of the football-rich south until she retired in 2012. Her son, Tyler Summitt, issued a statement Tuesday morning saying his mother died peacefully at Sherrill Hill Senior Living in Knoxville surrounded by those who loved her most. "Since 2011, my mother has battled her toughest opponent, early onset dementia, 'Alzheimer's Type,' and she did so with bravely fierce determination just as she did with every opponent she ever faced," Tyler Summitt said. "Even though it's incredibly difficult to come to terms that she is no longer with us, we can all find peace in knowing she no longer carries the heavy burden of this disease." Summitt helped grow college women's basketball as her Lady Vols dominated the sport in the late 1980s and 1990s, winning six titles in 12 years. Tennessee - the only school she coached - won NCAA titles in 1987, 1989, 1991, 1996-98 and 2007-08. Summitt had a career record of 1,098-208 in 38 seasons, plus 18 NCAA Final Four appearances. She announced in 2011 at age 59 that she'd been diagnosed with early onset dementia. She coached one more season before stepping down. At her retirement, Summitt's eight national titles ranked behind the 10 won by former UCLA men's coach John Wooden. UConn coach Geno Auriemma passed Summitt after she retired. When she stepped down, Summitt called her coaching career a "great ride." Peyton Manning, who sought Summitt's advice about returning for to Tennessee for his senior season or going to the NFL, said it would have been a great experience to play for her. "She could have coached any team, any sport, men's or women's. It wouldn't have mattered because Pat could flat out coach," Manning said in a statement. "I will miss her dearly, and I am honored to call her my friend. My thoughts and prayers are with Tyler and their entire family." Summitt was a tough taskmaster with a frosty glower that could strike the fear of failure in her players. She punished one team that stayed up partying before an early morning practice by running them until they vomited. She even placed garbage cans in the gym so they'd have somewhere to be sick. Nevertheless, she enjoyed such an intimate relationship with her players that they called her "Pat." Rest in peace, Pat Summitt. Known for her boundless energy, Summitt set her clocks ahead a few minutes to stay on schedule. "The lady does not slow down, ever," one of her players, Kellie Jolly, said in 1998. "If you can ever catch her sitting down doing nothing, you are one special person." Summitt never had a losing record and her teams made the NCAA Tournament every season. She began her coaching career at Tennessee in the 1974-75 season, when her team finished 16-8. With a 75-54 victory against Purdue on March 22, 2005, she earned her 880th victory, moving her past North Carolina's Dean Smith as the all-time winningest coach in NCAA history. She earned her 1,000th career win with a 73-43 victory against Georgia on Feb. 5, 2009. Summitt won 16 Southeastern Conference regular season titles, as well as 16 conference tournament titles. She was an eight-time SEC coach of the year and seven-time NCAA coach of the year. She also coached the U.S. women's Olympic team to the 1984 gold medal. Summitt's greatest adversary on the court was Auriemma. The two teams played 22 times from 1995-2007. Summitt ended the series after the 2007 season. "Pat's vision for the game of women's basketball and her relentless drive pushed the game to a new level and made it possible for the rest of us to accomplish what we did," Auriemma said at the time of her retirement. In 1999, Summitt was inducted as part of the inaugural class of the Women's Basketball Hall of Fame. She made the Naismith Basketball Hall of Fame a year later. In 2013, she also was given the Presidential Medal of Freedom, the nation's highest civilian honor. Summitt was such a competitor that she refused to let a pilot land in Virginia when she went into labor while on a recruiting trip in 1990. Virginia had beaten her Lady Vols a few months earlier, preventing them from playing for a national title on their home floor. But it was only in 2012 when being honored with the Arthur Ashe Courage Award that Summitt shared she had six miscarriages before giving birth to her son, Tyler. She was born June 14, 1952, in Henrietta, Tennessee, and graduated from Cheatham County Central High School just west of Nashville. She played college basketball at the University of Tennessee at Martin where she received her bachelor's degree in physical education. She was the co-captain of the 1976 U.S. Olympic team, which won the silver medal. After playing at UT Martin, she was hired as a graduate assistant at Tennessee and took over when the previous head coach left. She wrote a motivational book in 1998, "Reach for the Summitt." Additionally, she worked with Sally Jenkins on "Raise the Roof," a book about the 1997-98 championship season, and also detailed her battle with dementia in a memoir, "Sum It Up," released in March 2013 and also co-written with Jenkins. "It's hard to pinpoint the exact day that I first noticed something wrong," Summitt wrote. "Over the course of a year, from 2010 to 2011, I began to experience a troubling series of lapses. I had to ask people to remind me of the same things, over and over. I'd ask three times in the space of an hour, 'What time is my meeting again?' - and then be late." Summitt started a foundation in her name to fight Alzheimer's in 2011 that has raised millions of dollars. After she retired, Summitt was given the title head coach emeritus at Tennessee. She had been cutting back her public appearances over the past few years. She came to a handful of Tennessee games this past season and occasionally also traveled to watch her son Tyler coach at Louisiana Tech the last two years. Earlier this year, Summitt moved out of her home into an upscale retirement resort when her regular home underwent renovations. Summitt is the only person to have two courts used by NCAA Division I basketball teams named in her honor: "Pat Head Summitt Court" at the University of Tennessee-Martin, and "The Summitt" at the University of Tennessee-Knoxville. She also has two streets named after her: "Pat Summitt Street" on the University of Tennessee-Knoxville campus and "Pat Head Summitt Avenue" on the University of Tennessee-Martin campus. She is survived by her mother, Hazel Albright Head; son, Tyler Summitt; sister, Linda; brothers, Tommy, Charles and Kenneth. Tyler Summitt said a private funeral and burial will be held in Middle Tennessee and asked that the family's privacy be respected. A public memorial service is being planned for Thompson-Boling Arena.